Note the lone signature of Eugene Mirman. After the comedy festival show, we hung around and Eugene was the first to etch his signature to the poster. 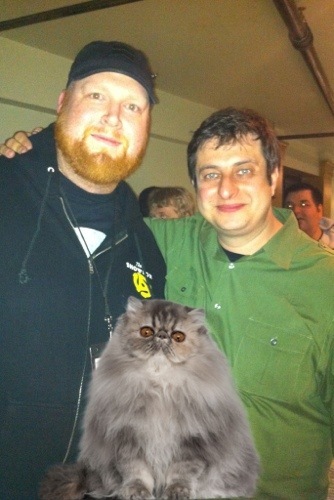 I took a picture of Joel with Eugene, onto which I added a picture of a cat. Joel currently uses this as his bio picture on his work website. We waited around for Kristen Schaal, but she never came out to greet her adoring fans. We were disappointed, and have, in the months since and with varying degrees of affection, taken to calling her “that horse,” due to a particularly memorable bit she performed that night with Kurt Braunohler. We knew we’d probably see her perform again, and anyway, we had tickets to see another Bob’s Burgers comic the following month: Bob himself. And so we waited. Patiently. For a year. 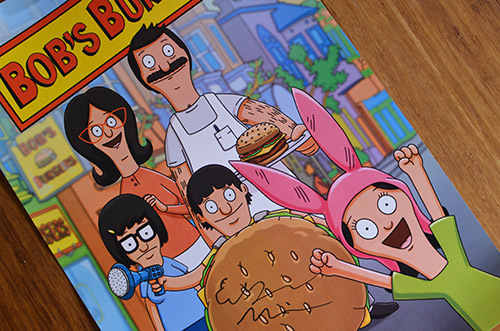 When finally, the Bob’s Burgers tour came to Seattle. So imagine our disappointment when, after the Thursday night performance where we laughed along with the huge crowd of Bob’s Burgers fans, after the years of being fans of the show (since the first episode, guys), after the year of waiting to collect those signatures … the security crew at the Neptune told us to leave because you all had already snuck out the back. But we learned later, through a tweeted exchange with one Mr. Eugene Mirman, that actually, when you came out after the show to greet fans, we were all gone. Well, now you know why. It’s not because we didn’t want to meet you or want you to autograph our posters. We did! It’s because the security crew are all a bunch of horses. Now, come back to Seattle and sign my poster! I’m a big fan of the show It’s Always Sunny In Philadelphia and when I sat down to watch the season premiere, I was literally shocked that Mac, one of the main characters, had gained 50 pounds and taken to carrying around a garbage bag full of chimichangas. In case you’ve never seen the show, the basic premise is that three guys own a bar along with one of the guys’ dad (that’s Danny DeVito’s character) and his sister tends bar. It’s kind of an anti-sitcom, because where most sitcoms feature likable characters pulling laughable pranks and learning valuable life lessons, the five characters on It’s Always Sunny are shallow, greedy, stupid, and repeatedly make the same mistakes in nearly every episode. But it’s somehow hilarious. So after I’d finished watching the episode, I took to google to learn about Mac’s weight gain, where I came across this interview where the actor explained the whys and hows. I was watching a popular sitcom, and I noticed that the actors were getting better looking as the years were going by, and I started to think about any show that I have ever seen in which that wasn’t the case. Donuts. I actually worked with a nutritionist to try and do it as healthy as possible, but at a certain point I just needed to consume as many calories as possible. And, he said go for the donuts so that’s what I did. I would literally eat six to eight donuts everyday through production. That was amazing. I will not lie to you. [They were] from a local donut shop that baked them fresh daily. I was originally buying some of those donuts that you can find prepackaged in the supermarkets, and my nutritionist was like, “Look. If you’re going to eat donuts everyday, don’t eat those, because they have a shelf life of six months, and they’re pumped full of so many preservatives and chemicals that you’re going to wind up even sicker than you would be otherwise.” So, I was literally encouraged to find a healthier form of donut, and I found that in the form of a local bakery. Now, I’ve never had a problem with gaining weight, but many Celiacs end up very underweight when they are diagnosed because of nutrient deficiencies and have to put pounds on. My dad was one of those, and I remember him loading a sandwich bag full of macadamias, peanuts, almonds, and cashews everyday, and eating bigger breakfasts of eggs and bacon. Sounds tasty, and paleo-friendly, right? But I’ve read on the celiac.com message boards, that some Celiacs who need to gain weight are advised by their doctors to eat all the Skittles and M&Ms and gluten-free cookies as they want. Because, like donuts, refined sugar + vegetable oil + oh, what the hell, a little refined flour (even the GF ones) = weight gain. I totally respect the decision of It’s Always Sunny‘s Rob McElhenney to gain weight for his role, and the show is portraying it pretty accurately: in the season premiere episode, Mac goes to a doctor and is diagnosed with Type 2 Diabetes (which he pronounces “diabeetus.”) But there are people out there who really do need to gain weight, and actors who put on weight for roles and even their doctors say to eat junk food. There really are healthier ways to gain weight!